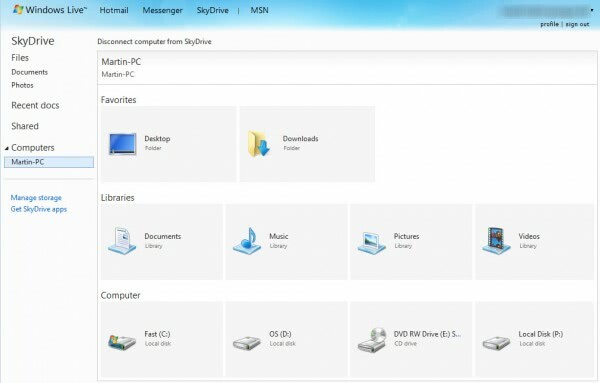 With Microsoft's release of SkyDrive apps for Windows and Macintosh PCs comes a new option to access all files on a computer via the SkyDrive web interface, provided that the feature is enabled on the PC, and that the computer is currently connected to the Internet. This short guide looks at how SkyDrive's remote access feature is configured, and what you can do with it once it is. First thing that you need is the SkyDrive app. For this example, we are using the Windows application. Download and install the program. You are asked to enter your Windows Live credentials to link the computer to the SkyDrive online account. 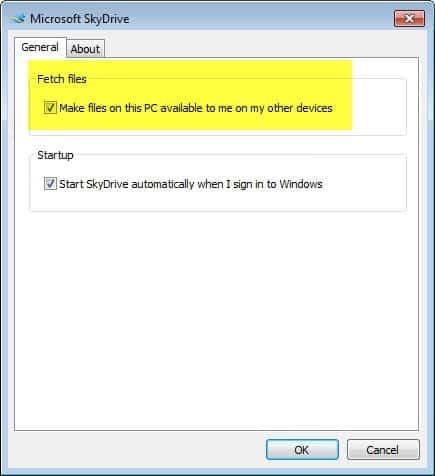 The SkyDrive folder is created in the selected folder, and the synchronization with files hosted at SkyDrive begins. While we are at it. Skydrive users should head over to the Manage Storage page on the SkyDrive website to increase the available storage from 7 Gigabyte to 25 Gigabyte while available. 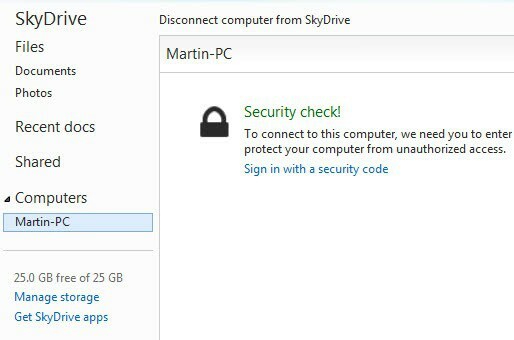 Note that it is necessary to log in to SkyDrive before the option becomes available. A right-click on the SkyDrive apps' system tray icon, and the selection of Settings from the context menu opens the remote file access configuration option. Make sure that the Fetch Files option is enabled here. To connect to this computer, we need you to enter a security code. This extra step only takes a minute and will help protect your computer from unauthorized access. A click on sign in with a security code sends a code to the connected mobile device if the computer is not recognized by SkyDrive, or to an email address connected to the account. This is a one-time process on trusted PCs. Once you enter the code, you will see the PC's favorite folders, the libraries, and all drives connected to it in the web interface. From here you can click on a drive to access all files hosted on that drive. You can for instance click on an image to display it in the web interface, download a document or spreadsheet, or other files that you need access to right away. 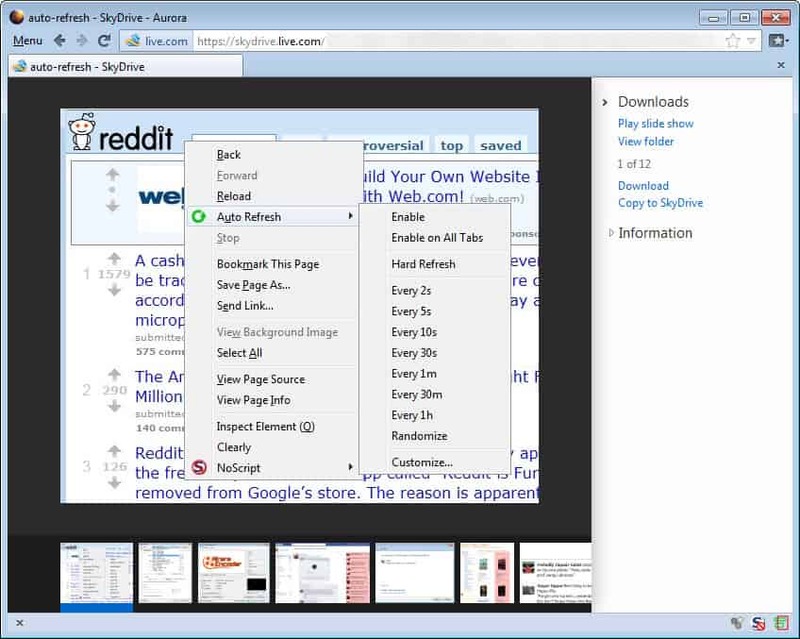 There are interestingly enough options to browse through all images in a selected folder, to download selected files, or copy them to SkyDrive. The feature can be interesting for users who sometimes need to access files on other computers that they do not want to host in the cloud. It can also be helpful if you sometimes forgot that you need access to files on a computer. Have you played around with the new SkyDrive apps and features yet? If so, what is your impression so far? Ah well. Guess Linux users are left out again for sync software. Do you really expect Microsoft to care about that in this instance? This is great article….and it works great IF I USE IE….but when viewing the Live web site with my Firefox and try to see the entire content of my machine….the Computer name DOES NOT show up and it does not work at all with FF…..bummer. Mu new iPad app works great, the iPhone app works great..but FF wont see my computer name…..
We hear, and i have personally experienced users hacking into Hotmail accounts. My password is pretty complex so i don’t think someone guessed it. This new feature adds major risks in case this happens – i.e. the hacker can now access files on your local PC. What are your thoughts on stopping users hack Hotmail accounts and how best can we prevent this? Is this feature really safe if confidential data is on the PC? I can see my computers listed, but when I choose them it states that I need to be sure that my computer is on, connected to the internet and fetch files is chosen. My computer is on, but it does log off. It is connected to the Internet, but the browser is not open. I have chosen fetch files. Any ideas?